Frosty's Estimation Station, created by Ms. O'Prandy, challenges first graders at Port Monmouth Road School in Keansburg, NJ, to estimate how many cotton balls fill up Frosty. 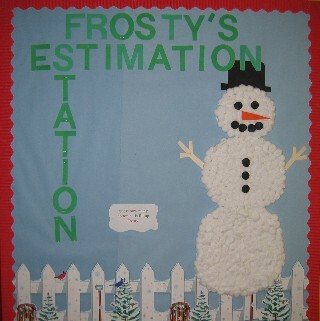 See Snowman Problem Solving for Frosty's Estimation Station and other snowman problem solving activities. Gingerbread Man Glyphs, created by Mrs. Ziegler's and Mrs. Campbell's second graders at Port Monmouth Road School in Keansburg, NJ, represent data about student ages, number of siblings and favorite things. See Student Work: Winter Math Activities for more pictures of winter glyphs. 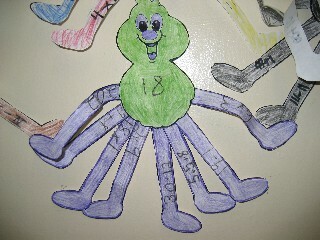 See pictures of Name-Collection Spiders created by Ms. Collier's and Ms. Rachko's fourth graders at Joseph C. Caruso School in Keansburg, NJ, to extend the Everyday Math name-collection boxes to a Halloween activity. This activity could also be used in conjunction with the study of Charlotte's Web. The classroom version with one die challenges students' perceptions of the probability of a single dice throw. How long can you safely collect points before a "1" is thrown? Use this for simple addition practice of several addends. Challenge student groups to develop winning strategies and raise the bar for critical thinking about a simple one-die game. Download Skunk Game: the game of Pig moves to a new level with this version. Just when students think they have a winning strategy for pig, introduce Skunk and challenge them to develop a winning strategy for this version.